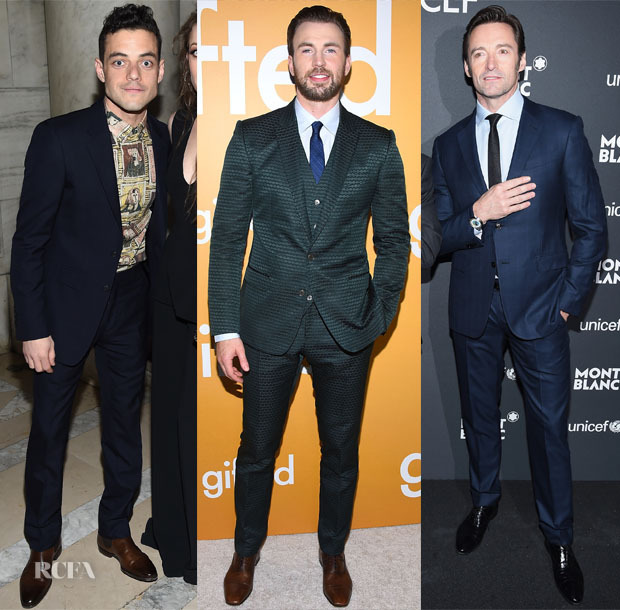 From New York City to LA, here is a quick roundup of the latest menswear looks from a trio of actors. Rami Malek: In attendance at the Montblanc & UNICEF Gala Dinner on Monday (April 3) in New York City, the actor wore a Burberry midnight-navy suit with a MONTBLANC ‘Heritage Spirit Automatic’ timepiece. Rather than a tie, he opted for a decorative button-down shirt with an artistic motif that reminded me of Modigliani paintings. Chris Evans: Looking quite dapper as per, Chris was at the LA premiere of ‘Gifted’ on Tuesday (April 4). His three-piece Dolce & Gabbana suit got an extra boost from its embossed, dark emerald sheen contrasted by a bright blue tie. Christian Louboutin ‘Greggo’ shoes completed his look. Hugh Jackman: With a more traditional suited-up look than Rami, Hugh was at the same event in sharp blue tailoring, where he made sure to show off his MONTBLANC ‘Heritage Spirit Orbis Terrarum’ timepiece.